How to Stop Google from recording your Search habits ? AOL, the fourth most popular search engine, recently released search queries of 650,000 AOL subscribers on the Internet. Though AOL now says that it was a mistake and quickly removed the search data from their website, mirror copies of AOL search terms continue to be available across the web. It is a universal truth that all search engines, including Yahoo, Google and MSN, retain search data of their users which can easily give a clue about the person's identity and a glimpse into his mind and online activity. Though it is highly unlikely that Google users will ever come across this "AOL Data Spill" like embarrassing situation, the possibility cannot be ruled out completely especially after Eric Schmidt's remark that ".. this sort of thing would not happen at Google although you can never say never." If you are worried that some day Google, by mistake, might disclose your private search terms into public internet domain, try some of the following suggestion that may fool the search engine or give it a hard time recognizing you. 1. Disallow Google to Store Cookies - The important thing is that it doesn't suffice blocking cookies from just google.com domain, you must also block cookies from google site in your country. For example, in India, one would block google.com and google.co.in - This is because Google redirects you to your local country page when you type in google.com in the browser address bar. 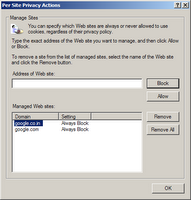 To block cookies, open the Cookie blocking dialog in your browser, type the site url and click disallow or block. Remember that Google Personalized Search History won't work after you disable cookies from Google.com. Also, you may have to type the user name and password of other Google services like each time you have to login since cookies are disabled and you won't be automatically logged in. 2. Use Scandoo - Scandoo is a wonderful wrapper written around search engines that warns you of malicious websites in search results. Now the good part is that Scandoo can help you search Google, Yahoo or MSN without disclosing your actual geographic location (or IP Address) to the search engine. 3. Download HideMyIp software - Your IP address is one big link between your search queries. You would be lucky if your ISP provides you a dynamic IP address that changes frequently but if you are stuck with a static IP, you can still hide it with Hide MyIP address software. 7. Don't use Google or Yahoo to search the web as they will store your entire trail of activity on their servers. Try Clusty.com or Ixquick.com which do not save users search data. Clusty is a meta search engine based on Vivisimo clustered search - It queries several top search engines, combines the results, and generates an ordered list based on comparative ranking.